I’m not usually one to sit and watch a documentary. That is, unless the subject is one that’s really fascinating. So when Propeller/FlyBy Promotions asked if I wanted to watch and review Patterns of Evidence: Exodus, I said yes because it sounded so interesting! The film took 12 years to develop and takes a scientific approach to investigate the events of the biblical Exodus. The overall vision for this film company is to explore “patterns of evidence” that support the biblical narrative and engages the world in a conversation. I’m not going to give anything away about the evidence presented, but I will say that it is indeed done in an honest, balanced, and respectful way. The film was one that my entire family sat down together to watch, and we had some really good family discussions about Scripture, opinion, archaeological evidence, and more. In a world of entertainment that tends to offer very little in the way of “brain food,” we were grateful to watch a film that was thought-provoking. To find out more and watch a trailer, visit www.patternsofevidence.com. To buy the film, please visit https://store.patternsofevidence.com/collections/movies. FlyBy Promotions has graciously allowed me to offer readers a discount code to use for $3.00 off the film, which retails at $19.95. Use the link above and then discount code: MK1. Also, Propeller/FlyBy Promotions has a DVD to give away to one reader! 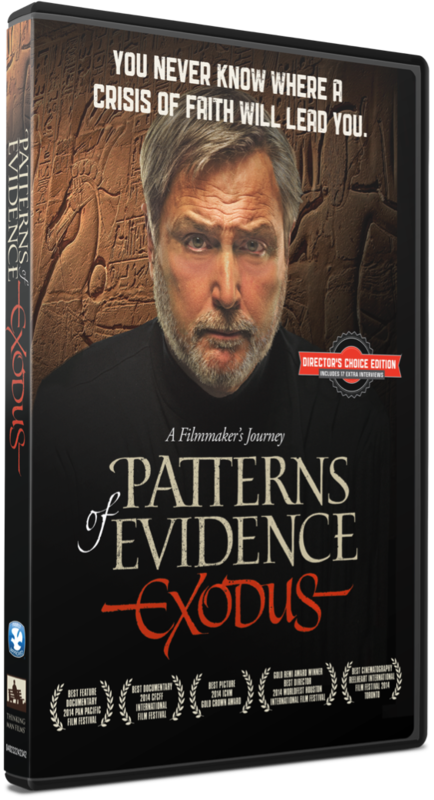 Simply leave a comment below and one commenter will be randomly selected to win a copy of Patterns of Evidence: Exodus. Giveaway is open from now until September 10th.